In 1666 a great fire ravaged London for 3 days, devouring 13,200 houses, 87 parishes, St Paul’s Cathedral and most of the buildings of the city’s government. At the time, there were about 80,000 people living in London and it is estimated that 70,000 of that total number lost their homes. The fire, which apparently started on Pudding Lane, in the bakery of Thomas Farriner, very nearly reached Whitehall Palace where the current monarch of the day, Charles II, was in residence. Surprisingly, only 6 deaths were verified. On the corner of Monument Street and Fish Street Hill stands a monument to the Great Fire commissioned by Charles II. 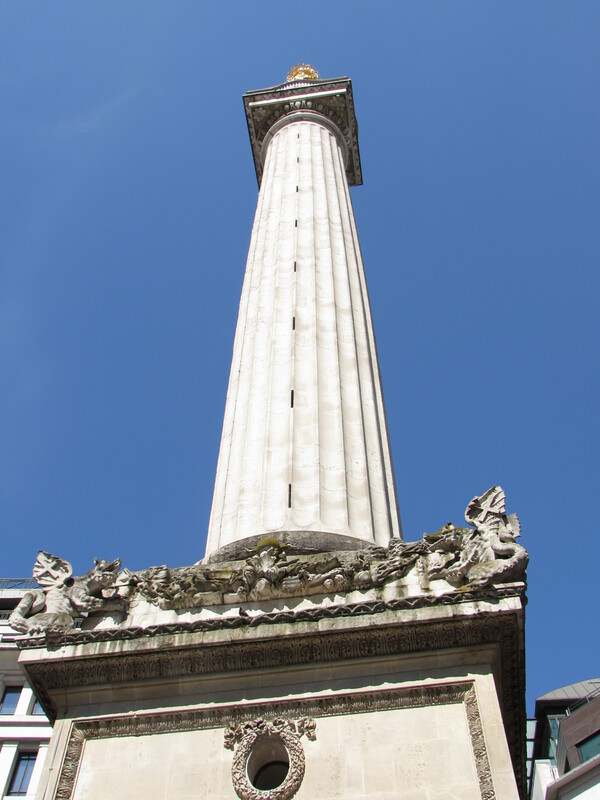 Identified simply as “The Monument,” it is described as a fluted Doric column and stands 202 feet from where the Great Fire started. 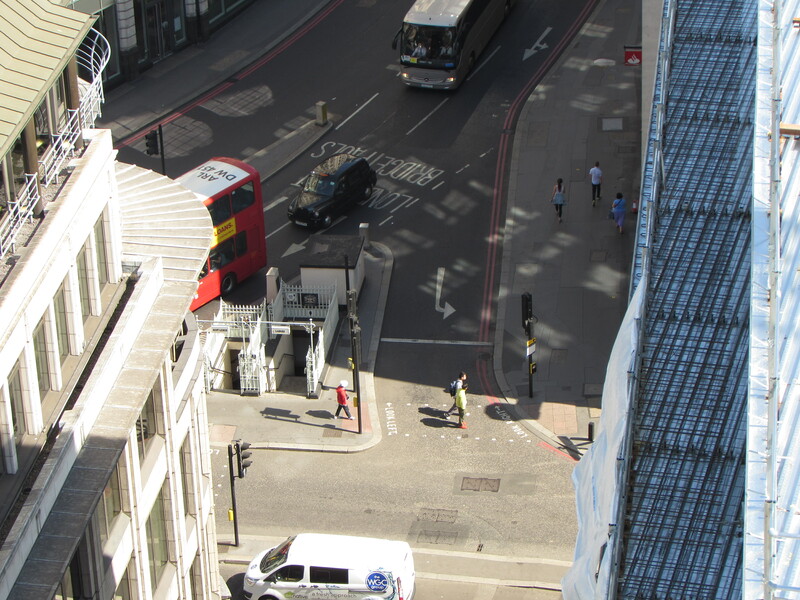 Until very recently, I didn’t know that you could go up the Monument. 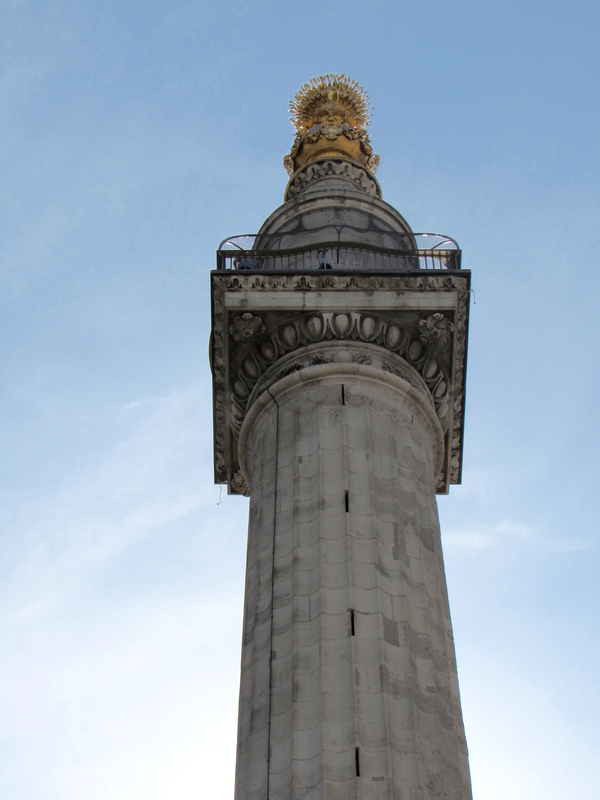 On a bright, breezy and sunny Saturday morning, Alan and I went up the Monument. I approached this challenge with trepidation. I am not the fittest of people and have been known to huff and puff on some days when brisk walking from my flat into town to get groceries. I’d much rather read than walk these days. So this activity worried me a lot. 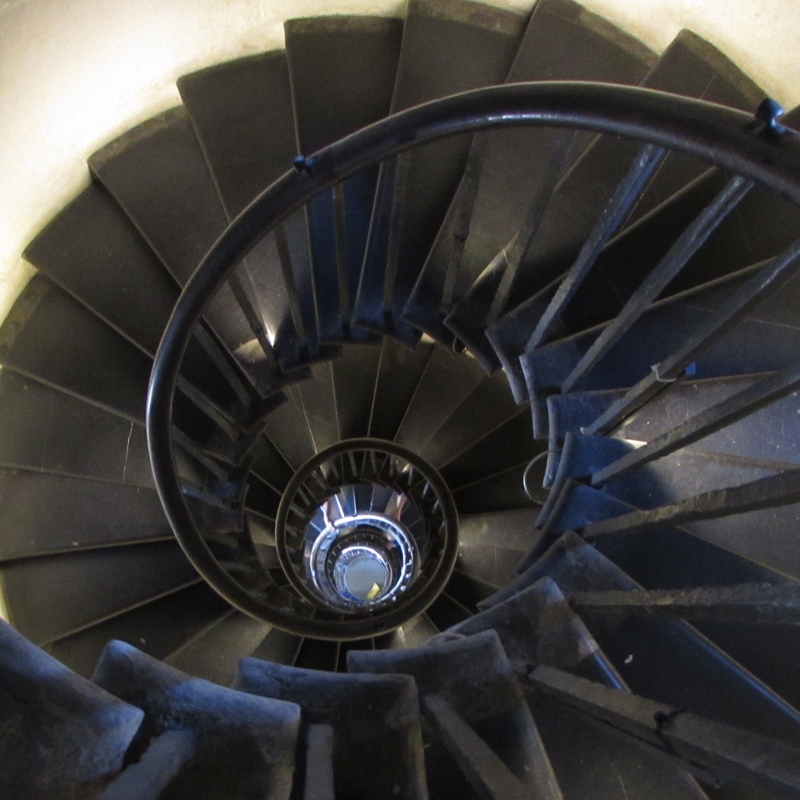 I was afraid I’d embarrass Alan by wanting to stop in the middle of the trek up to the top of the Monument. So we paid our £4 for the privilege (it’s £4 for each adult to go up but we had a 2 for 1 voucher, so it was only £4 for the 2 of us) and up we went. There are 311 steps. Yes. Three. HUNDRED. Eleven. Steps. At first, I wondered why there were hooky bits along the banister. 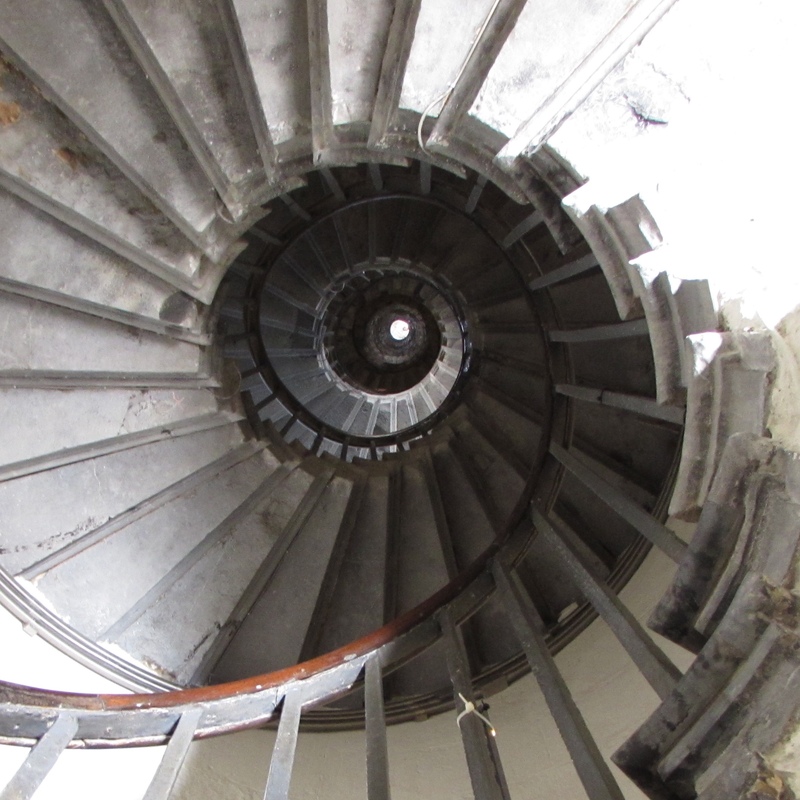 Then I figured, about a third of the way up that you could use those hooky bits to pull yourself up the steps! There were these lovely little alcoves as you went up and boy, was I ever grateful they were there! You could sit down, catch your breath while not get in the way of the other people, more fit than you who trudged up that blessed spiral staircase! But somehow, despite the huffing and puffing, screaming leg and thigh muscles, thinking in my head that I was going to die soon, I made it up the top! I had to catch my breath first. But after that, after I recovered from the jelly legs and shortness of breath and pounding heart, I looked around and marveled at the view. It was glorious! 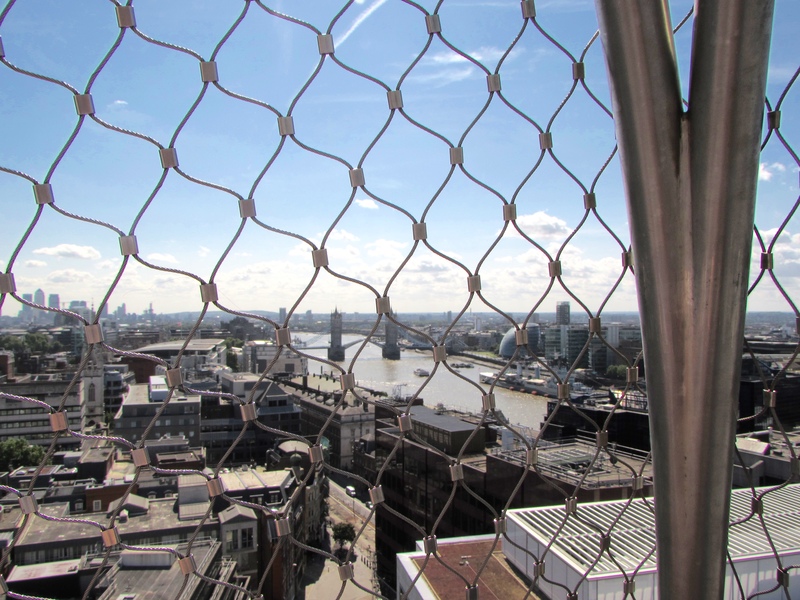 The mesh cage at the top was added mid-19th century to prevent any other persons from leaping off the the platform. I think it was a good decision! 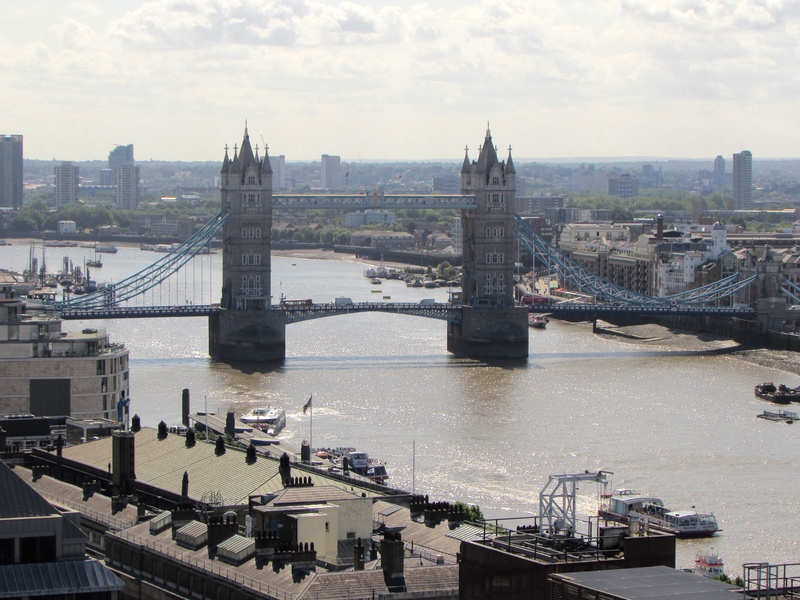 You get to see the Tower Bridge. 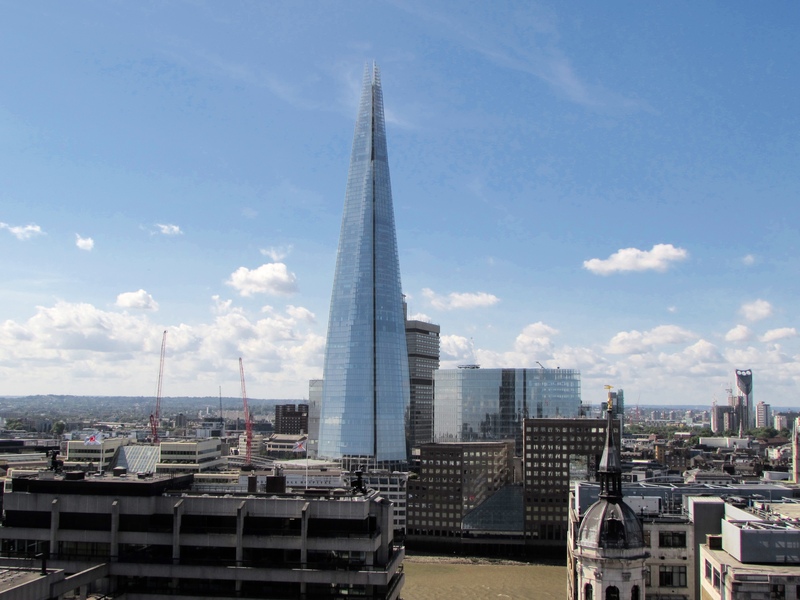 An unobstructed view of the Shard. 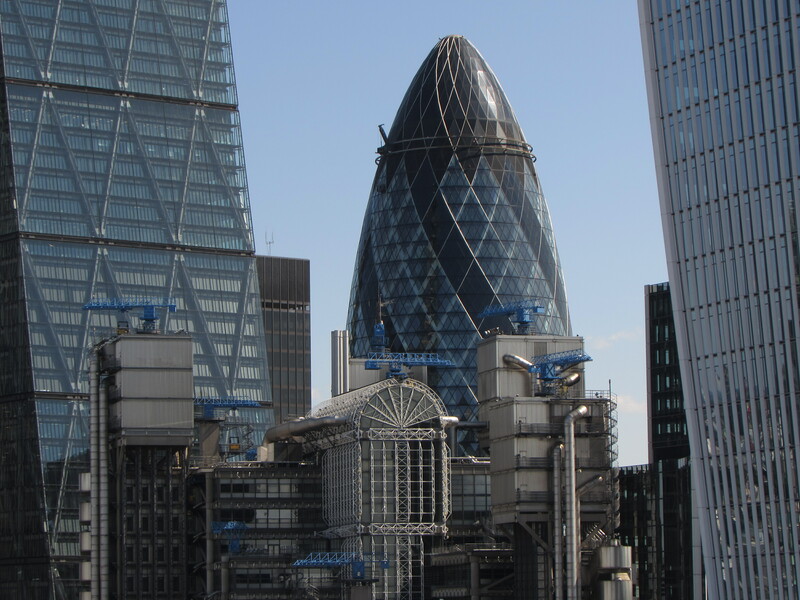 The The Cheese Grater (the Leaden Hall building), the Gherkin (30 St Mary Axe) and the Walkie-Talkie (20 Fenchurch Street) and the Lloyds Building. 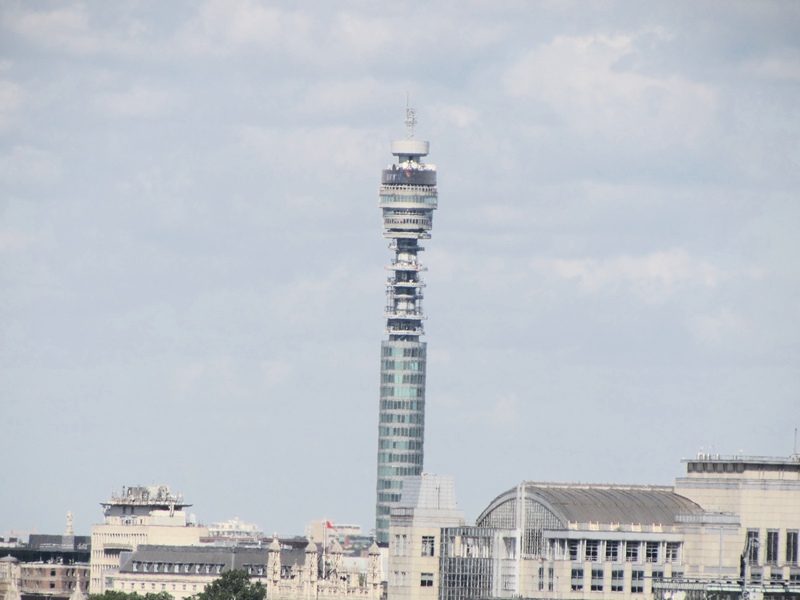 So, if you want a challenge, a work out with a reward of a brilliant view of London, go up the Monument. Despite the palpitations, the hyperventilation, the jelly legs, the view is spectacular and very definitely worth it! Previous PostBeseder the Bell and Brisket!